Physics Buzz: 2008 is Coolness. While this doesn't explain why I come into the office every morning with a sweater handy and scarf draped around my neck (thanks to frigid and relentless office air conditioning), it might raise some eyebrows: 2008 looks like its going to be globally, the coldest year of the 21st century. Meteorological data shows that for the first half of the year, temperatures were more than 0.1 Celsius cooler than any year since 2000. Despite this, 2008 still appears to be about the 10th warmest year since 1850 (there's nothing like a little broad comparison). 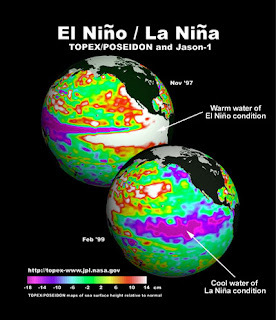 In any case, scientists believe the reason for the chilliness is La Nina, twin counterpart to El Nino. Both are extreme natural phases of a continuous climate cycle. They cause massive changes in water temperatures in the eastern Pacific Ocean, which in turn cool down the entire globe. Physics plays a huge role in modern climate change. It allows researchers to explore tough (and often controversial) questions surrounding global warming and the like. For example, variations in solar radiation has been proposed as a possible cause of global warming, and viewed by some as an alternative explanation to the greenhouse effect (increase of carbon dioxide in the atmosphere). Areas of physics and mathematics like thermodynamics, electromagnetic radiation, and statistics are used to find solid evidence either supporting or debunking current theories of climate change. But what about the bigger picture? Although mainstream media largely ignores this fact, climate change doesn't equal warmer temperatures every decade. It changes alright, but rather fluctuates in many directions- hot, cold, arid, wet, you name it, over vast periods of time. This little subtlety, that the earth is a multifaceted control system that doesn't just depend on one ingredient, makes physical models of our climate essential to figuring out how the whole stew comes together. Highly complex climate models can predict future change based on how the earth, ocean, and atmosphere interact. Brad Marston, a physicist at Brown University, uses the drying of Lake Mead in between Nevada and Arizona, as an illustration. Scientists believe that less rainfall is occurring in the area due to global warming-related weather patterns. Computer simulations can track rainfall patterns and predict possible consequences for the lake. Think of a set of Russian Matryoshka dolls, within each doll nests another, and another, and so on. Physical models can determine the larger-scale processes that affect rainfall, such as shifting storm tracks.